Ildsjel in Toronto’s Port Lands has an unassuming exterior but inside it’s full of creative and collaborative art projects. A band is setting up drums and guitars for a recording session, a moulding machine is creating pieces for a board game and a laser is cutting out cardboard robots. There's a trophy case crammed full of Batman sculptures and there are posters on the walls for music jams, seminars on creative thinking, 3-D printing courses and a Friday night movie. If the scene at the Ildsjel creative lab sounds a bit like life in an eclectic dorm, there's some truth to it, but there's a vision behind it. Ildsjel (pronounced ills-jell) is Norwegian for driving force and enthusiasm, explains Rebekka Zuckermann, whose title is co-founder and thinker. "Creating energy is the goal. We want a space where arts and culture startups can come together to experiment, share ideas and socialize." The lab is a co-working space, but unlike similar facilities that offer a shared office, there are not just desks and tables to work at but also a print studio, an event space, a recording studio, and benches in a light manufacturing laboratory to create electrical or mechanical prototypes. The MakerSpace is a multidiscipline engineering lab within Ildsjel. "It all works collaboratively. For instance, a product designer can use a bench and equipment in the MakerSpace [a multidiscipline engineering lab] to 3-D print a project, then work with the resident graphic designer to create marketing for the product. Or you may find bands recording soundtracks in the recording studio for the film production company that's renting space here," says Dimitri Kanaris, another co-founder, whose title is talker. As unique as Ildsjel's space is, its location is even more outside the box – in an underutilized area of downtown Toronto known more as an industrial zone. The Ildsjel team first looked at locations in the established creative neighbourhoods to the west of downtown, where they found high rents and fierce competition for suitable warehouse space. But with the assistance of real estate service CBRE Ltd., they located a suitable space in the underdeveloped Port Lands area east of the core that had rents about a third less than in other parts of the city – about $35 a square foot, compared to $45 to $50. The trophy case full of Batman figurines suggests Ildsjel isn’t your usual co-working space. Ildsjel rents about 6,100 square feet of what was formerly a commercial lighting showroom. It's part of a converted 35,000-square-foot industrial complex at the foot of Carlaw Avenue, south of Lake Shore Boulevard East, owned by Atria Development Corp. Since Ildsjel opened in May, 16 individuals and organizations have become members of the creative collective, paying by the hour for the shared space, and a few have subleased parts of the building for full-time use. Dan Sadaba, whose Sadabots graphics company rents a corner of Ildsjel, had worked at three printing companies before deciding to set up his own business. He'd originally considered moving to Hamilton to avoid high rents in Toronto, but he found that rent on a 60-square-foot space at Ildsjel was affordable for his business designing laser cut cardboard figures and printing signs. The 6,100-square-foot facility has plenty of creative spaces but also a boardroom for more conventional business operations. "Creatively I'm now in control of my work and the collaboration here helps me find clients," he says. He defrays the cost of the floor space by renting use to other tenants of a high-tech printer that he's leased. In the complex he also has access to equipment such as laser cutters and plotters that he couldn't afford to buy. Another tenant, RHC Music, leases a two-room recording studio with a full array of stands and microphones that are available for other musicians to rent, along with mixing services. The studio was set up in a former storage area inside the Ildsjel complex that, with a few adjustments to the already good acoustics, became a sound stage. 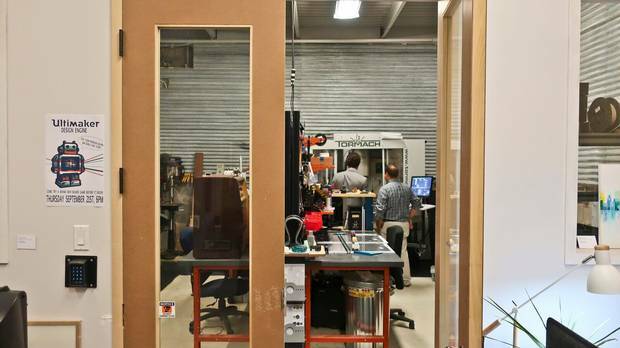 The most eclectic zone is the MakerSpace, run by Jason Kanaris, another co-founder, whose title is engineer. His company OmiTech Solutions owns a wide range of machines for trades from electronics to woodworking. Stand-alone equipment includes automated machining equipment, drill press, table saws, and 3-D printers. They're available along with five separate workbenches for rental by the hour, along with a complete library of tools. "We rent spaces to people who might otherwise be working on their kitchen table and also for professional projects. The mandate is to have the basic resources for just about any specialty," Mr. Kanaris says. A laser cutter is available for rent at Ildsjel for creators who couldn’t necessarily afford one themselves. Wallace Immen/The Globe and Mail. Peter Sanfilippo, the fourth co-founder, whose title is poet, says the interactions in the space are already affirming the concept of the space as a collaborative community. "You're part of a large group of friends that are empathetic about each other's work and that puts everyone more in touch, and aware of what people are working on," he says. "If you're coming in and working on a painting or a sculpture, people are curious and will offer something to it. It's, hey, I'm doing this that might lend itself to what you're doing." To increase the collective feel, Ilsdjel also plays host to regular social events, which are open to the public to stimulate a market for the products developed at the space. Ilsdjel's concept was difficult for landlords in the more developed areas west of Toronto to grasp, says Rob Sweeney, tenant adviser at CBRE who co-ordinated the real estate search. A recording studio was set up in a former storage area inside the Ildsjel complex that, with a few adjustments to the already good acoustics, became a sound stage. "We were going around to buildings and there was always that question from landlords: What do you want to do here? It isn't something that's easy to put on paper. You have to come in here and see the community to understand what they're talking about." In the creative zones of Liberty Village and West Toronto, he found that landlords are more attuned to offices and restaurants, and don't understand a multifunction creative space. "There's such a demand for space in Toronto that they have lots of options." Looking further afield, the search also looked at a warehouse space east of downtown on Eastern Avenue, an area known as Leslieville. The warehouse was a walkup from ground level and, in another challenge, it needed a lot of renovation to make it useful as a multiuse space. The ground floor site to the south in the Port Lands fit the collective's needs better and required less remodelling, so Ildsjel was able to open within six months of closing its tenancy deal. The Port Lands may be in a lesser-known area but it is destined to become more popular with artists, Mr. Sweeney predicts. It's about 356 hectares (880 acres) that stretches from the Inner Harbour on the west to Leslie Street in the east, and from Lake Shore Boulevard in the north to the Outer Harbour in the south. The lands continue to be used for industrial, recreational and port functions, but there are large amounts of vacant buildings and underutilized land that are prime for reuse by creative firms, he says. A commitment from federal, provincial and city governments to remediate contaminated soil in the former industrial zone has made the area the focus of new attention for redevelopment. "What I see happening is [rental] rates will keep stepping up across the city, and the east side is the next logical place for growth," Mr. Sweeney says.